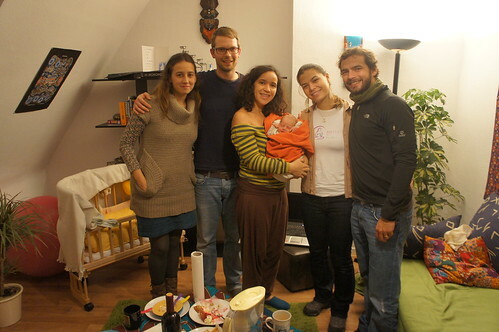 The birth model in Germany surprised us! 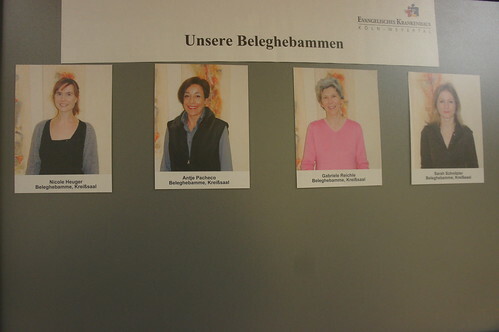 We visited some hospitals, Geburtshaus (birth Center). I also went with the midwife (Hebamme) Birke Heinrich to prenatal and post partum visits and participated in a mothers postpartum group, which is also given by the midwife. We interviewd Birke that works at Geburtshaus Mariemplatz em Liepzig and also Kátia, a brazilian mom and her husband that just had a beautiful babygirl, Liz. Wonderful interviews!! I will write about birth in Germany illustrating with Katia’s birth story. As soon as Katya discovered she was pregnant she wanted to have a c- section. She was afraid of childbirth and also most of her friends and family in Brazil had ended up with a c-section.? In the begining of pregnancy they received a booklet explaining all their options and rights during pregnancy, childbirth and postpartum. The woman is encouraged to do groups during pregnancy. If the couple has not made the group during pregnancy, the health plan calls home encouraging them to do it, remembering about their rights. They chose the intensive pregnancy group, from Friday until Sunday, where is talked about pregnancy, nutrition, anatomy, childbirth, baby care, postpartum, delivery options and their rights. She can also choose to be accompanied by the doctor or midwife. Kátia started the pregancy check ups with a doctor as she wasn’t aware she could be with a midwife too. At 28 weeks they started to see the midwife. They can also change their doctor or midwife if they wish. The woman can choose to give birth in hospital, birth center or at home. If she wants the same midwife during prenatal and birth she may have to pay a certain amount which is very low so she is avaliable 24 hours. But the concern to have the same professional during prenatal and birth is not a big issue, Kátia said, since you know you will be respected anywhere, with any staff and then you feel safe anyway, aswell as you have the right to deny any procedure. The woman can choose normal birth, natural, with analgesia and cesarean section. Katia was thinking about having a cesarean section, but she said woman are very encouraged to have a natural childbirth. If you say you want a cesarean section the other mothers will think you’re crazy! The professionals will talk with you to understand why you want a caesarean, because probably the decision is made based on missinformation. Katia said that during pregnancy group she made the mistake to tell another mother that she wanted analgesia during labor, and she answered surprised: – But why do you want analgesia? Think better about it, natural is much better! And the usual question is: – So, do you want to have a normal or a natural childbirth? Instead of: – So, do you want to have a normal delivery or c-section? The majority of natural low-risk births are attended by midwifes. At the birth centers and home births just midwives work, while at the hospital midwives and obstetrician work together. The midwife is requested to be present at all births, even during c-section. 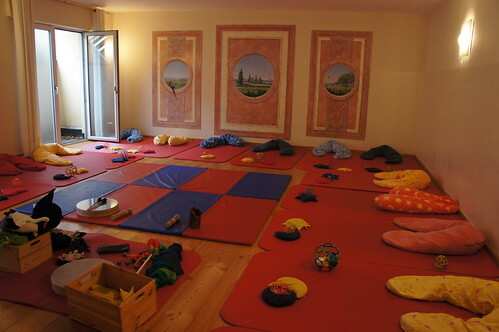 The birth centers (Geburtshaus) offer pregnancy and postpartum groups, yoga, antenatal and postpartum care, courses for the baby (baby massage, breastfeeding, how to carry the baby) and birth room. 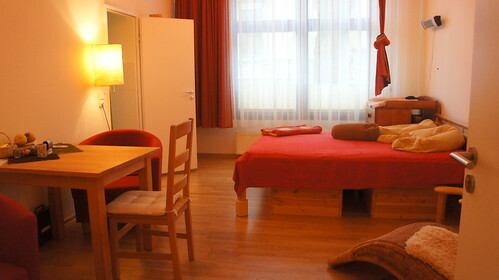 The womam can have all her antenatal care, birth and post natal care with the midwives from the geburtshaus, she can also choose to have a home birth or a hospital birth with the midwife. 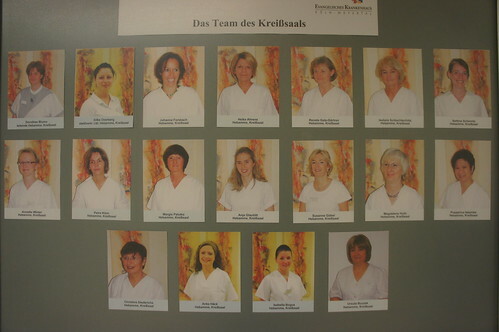 We visited two hospitals in Koln, which have systems similar to other hospitals in Germany. We were received by midwives who showed us the delivery rooms. 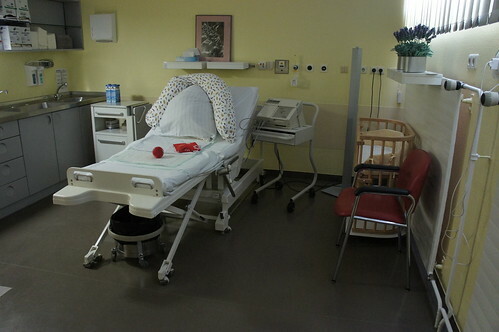 All the delivery rooms are used for labor, delivery and around 2 hours postpartum. 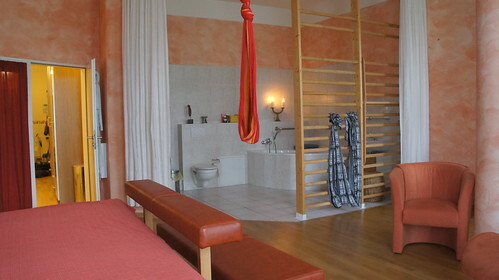 A cozy room (not as much as a birth Center or at home) with a bed, a rope to hang, birth stool and bathroom. 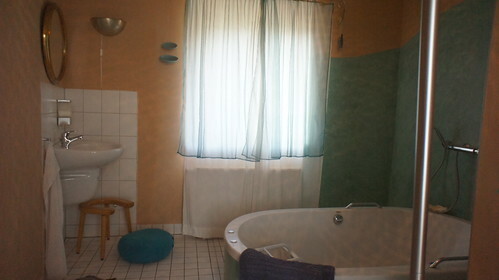 The bath is also available for Birth. You can choose how and where you want to have your baby. Interestingly, some hospitals have their own midwives who work for the hospital and also partnerships with midwives that work with home birth or in a birth Center. They can use the institution and go in and out with their clients. Katia said she had a wonderful birth experience. She chose the hospital because she felt safer. She stayed in labor for almost one day and met different staff. But everyone treated her well, like they were always saying goodbye and wishing her a good birth before leaving the room. She received analgesia in a very small dose so she could still feel the contractions. Analgesia made the contractions weaker and the labor stopped progressing for a long time, so they offered oxytocin. She refused a few times, but finally accepted a very small dose. As the contractions got stronger, she went up and stayed on all fours, with the head elevated. 15 min beautiful Liz was born! She was born to Kátia and went straight into her mother’s lap. After 15 min the cord was cut by the father. When everything was well with the mother and the baby the midwife turned of the lights and left the new family to rest for two hours. Parents can stay up to 5 days after c-section and 3 days after normal delivery, , in the case of normal delivery leave a few hours after birth. Katya and her partner decided to go home a few hours after birth, and since everything was well with the mother and the baby they were released. In the postpartum period the new family can have postpartum home visits for 8 weeks, which were done by the midwife. During the first 10 days she can come everyday once or even many times, then until week 8 they have more 16 visits, after that they can have 6 more visits during the breastfeeding period. 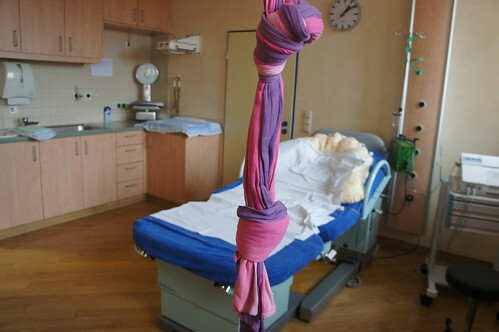 The worksituation for midwifes in Germany is harder then it used to be. By Law, every midwife has to pay a big amout to the insurance company to be able to attend birth out of a hospital setting. Which in total sums up to around 4000 euros per year. The insureance fees were rised, but not the midwifes salary. This insurance covers the case that parents decide to sue the midwife if something goes wrong during birth. This parental Right excists until 30 years after the childs birth. Due to this fact many midwives chose to quit to work idependently, in a birth Center or at home. A beautiful birth model but it is threatened. O Modelo de Parto na Alemanha nos surpreendeu! Nós fomos visitar alguns hospitais, casas de parto (Geburtshaus), acompanhei a parteira (Hebamme) Birke Heinrich em algumas visitas pré natal, pós parto e em um grupo de mães de pós parto, que também é conduzido pela parteira. Fizemos entrevista com a parteira Birke que trabalha na Geburtshaus Mariemplatz em Liepzig e também com a Kátia, brasileira, e seu companheiro Alemão que tiveram a linda Liz há duas semanas na Alemanha, foram entrevistas maravilhosas e inspiradoras! Eu descreverei sobre o processo de parto na Alemanha ilustrando com a história de parto da Katia. Logo que a Kátia descobriu que estava grávida estava certa que queria ter uma cesariana. Morria de medo do parto e também todas suas amigas e família no Brasil haviam acabado em cesariana. Mas logo no início da gestação, eles receberam uma apostila explicando todas suas opções e direitos durante a gestação, parto e pós parto. Você tem direito e é super incentivado a fazer grupos de gestantes / casais grávidos durante a gestação, yoga para gestantes, direito a ser acompanhado por médico ou pela parteira. Se o casal ainda não fez o grupo, o plano de saúde liga para casa incentivando a fazer e relembrando dos seus direitos. Eles fizeram o grupo de gestantes, escolheram o intensivo que era de sexta à domingo, onde foi conversado sobre gestação, alimentação, anatomia, parto, cuidados o bebê, pós parto, opções para o parto e seus direitos. Com 28 semanas eles começaram o acompanhamento com a parteira. Você pode ser acompanhada somente pela parteira, mas eles não tinham se dado conta dessa opção antes. Eles também podem trocar de médico ou parteira se quiserem. Você pode escolher ter o parto no hospital, em casa de parto ou em casa. Se você quer a mesma parteira durante o pré natal e parto talvez você tenha que pagar um certo valor (bem baixo) para que ela esteja disponível 24 horas. Mas não tem essa preocupação tão grande de ter a mesma pessoa que atendeu o seu pré natal atendendo seu parto, pois você sabe que será respeitada em qualquer lugar e com qualquer plantão, então a mulher se sente segura de qualquer forma, ela tem o direito a negar qualquer procedimento. A mulher pode escolher parto normal (parto vaginal), natural (sem intervenções, alnalgesia) , e cesariana. Kátia estava contando que você tem a opção de cesariana, mas você é muito incentivada a fazer o parto natural.Se você diz que quer uma cesariana as outras mães vão achar você maluca! Está doida? Fazer uma cesariana? E os profissionais vão conversar contigo para entender porquê você quer uma cesariana, pois deve estar faltando informação ou alguma informação deve estar distorcida. Kátia disse que durante o grupo de gestantes ela fez a besteira de falar para outra gestante que queria analgesia durante o parto, e a outra gestante ficou surpresa, mas porque você quer analgesia? Repensa melhor sobre isso, natural é melhor! E geralmente se pergunta – E ai, vai fazer parto normal ou natural? Ao invés de parto normal ou cesariana? A grande maioria dos partos naturais de baixo risco, o cuidado é baseado na parteira. Nas casas de parto e nos partos em casa apenas as parteiras trabalham, enquanto nos hospitais parteiras e médicos trabalham em conjunto. A parteira deve estar presente em todos os partos, inclusive nas cesarianas. As casas de parto (Geburtshaus) oferecem grupos durante a gestação e no pós parto, yoga, cursos para o bebê (massagem, amamentação, como carregar o bebê). A mulher pode ter todo o cuidado durante o pré-natal, parto em casa e na casa de parto e pós parto com as parteiras da Gebursthaus. 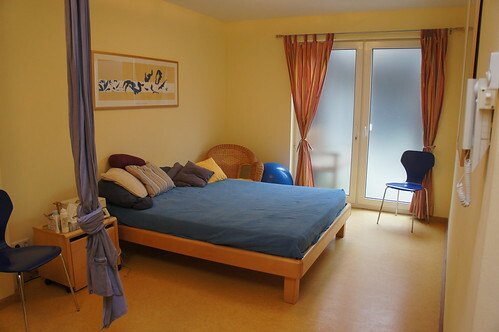 Os hospitais que visitamos em Colônia tem funcionam de forma similar a outros hospitais na Alemanha. Fomos recebidas por parteiras que nos mostraram as salas de parto, e falaram um pouco do funcionamento do hospital. Todas salas de parto são PPP (préparto-parto-pós parto). Um quarto muito aconchegante, com uma cama, uma corda para se pendurar, banco de cócoras, a banheiro, a banheira também está disponível. A mulher pode escolher como e onde quer ter seu bebê. O interessante é que tem as parteiras do hospital e as parteiras que tem parceria com o hospital, elas podem entrar com sua cliente e sair livremente. Kátia disse que teve uma experiência de parto maravilhosa. Ela optou pelo hospital por sentir-se mais segura. Ela passou por alguns turnos, ficou bastante tempo em trabalho de parto. Mas todos a trataram muito bem, sempre antes de sair eles iam no quarto se despedir e desejar um bom parto. Ela recebeu analgesia, mas uma dose muito pequena e ela ainda conseguia sentir as contrações. Com a analgesia as contrações ficaram mais fracas e o trabalho de parto parou de progredir por muito tempo, então foi oferecido ocitocina . Ela recusou algumas vezes, mas ao final aceitou com uma dose muito pequena. As contrações ficaram mais fortes, ela subiu na cama e ficou de quatro em cima da cama, que estava com a cabeceira elevada. Após 15 min nasceu a Linda Liz! Ela nasceu e foi direto para o colo da mamãe. Depois de 15 min o cordão foi cortado pelo pai. Estava tudo bem com mãe e bebê então apagaram as luzes e deixaram eles no quarto se curtindo e descansando por duas horas para somente depois fazer os cuidados com o bebê. Os pais podem ficar até 5 dias no hospital depois de uma cesariana e 3 dias para o parto normal, mas também podem ir embora algumas horas depois do parto no caso de parto normal. Kátia e seu companheiro resolveram ir para casa algumas horas após o parto, como estava tudo bem com mãe e bebê eles foram liberados. No pós parto eles tem direito a visitas pós parto em casa por 8 semanas, que é realizada pela parteira. Nos primeiros 10 dias ela faz visitas diárias ou até mais de uma vez por dia se for necessário. Depois ela faz mais 16 visitas até completar as 8 semanas, e pode fazer mais algumas visitas durante todo o Período da gestação. Mas qualquer coisa que os novos papais precisarem, ou qualquer dúvida é só ligar ou pedir uma visita. A sistuação de trabalho para as parteiras na Alemanha está mais difícil que costumava ser. Toda a parteira tem que pagar uma grande quantidade para o seguro para poder assistir ao parto fora do hospital, em torno de 4000 euros por ano. As taxas aumentaram, mas o salário não. Esse seguro cobre a parteira em caso de os pais decidirem a processar por alguma coisa que aconteceu durante o parto, que pode ser feito em um período de até 30 anos depois do parto. Por essa razão muitas parteiras estão desistindo de trabalhar nas casas de parto ou com partos em casa. Um modelo de parto tão lindo, mas está ameaçado! Mortalidade Neonatal: 2,3/ 1.000 live births (2009)? Cumprimentos por mais um “post”. Reforça o conceito de parto natural e seus pontos fortes. Porém, aparecem entraves como o seguro. É uma pena. Sim, sempre tem coisas a melhorar em todos os lugares, em níveis diferentes, mas é bom saber os dois lados e aprender com eles! Lindo o texto, mais uma vez parabens e obrigada compartilhar com o mundo essas informacoes tao preciosas. Adorei!!!!!! Muito bom o texto e as fotos… Obrigada por compartilhar. Mah! Um post mais lindo que o outro! Estou muito feliz com as peregrinações de vcs pelo mundo! Oi linda!!! Que bom que gostaste!! Muitas parendizagens sim! Estou adorando a viagem de vocês, quero muito saber como são os partos pelo mundo. Adorando e aguardando cada novidade. E quero fazer um pedido. Você pode aumentar seu trabalho um pouquinho? Quero muito saber quais os protocolos adotados quanto ao Recém-nascido e cada parte do Mundo. Por exemplo no Brasil temos algumas condutas tidas como obrigatórias: Vitamina K, Vacina contra Hepatite, CREDE, além dos tradicionais medir, pesar, apgar, exames 6horas, 12horas e 24 horas… enfim. Gostaria muito que em cada uma das reportagens que fala sobre o parto, também tenha comentários sobre as práticas com os RN. Agradeço muito por vocês dividirem conosco essa Viagem pelos Partos pelo mundo. Que bom que estás gostanto da viagem! Nós também! Fico feliz que minha questão seja pertinente e que teremos essas informações também. Continuo na garupa da viagem de vocês. Uma boa viagem para vocês. Excellent Ma! Stories and statistics….a perfect combination. Thank you. Don’t forget we’re waiting to see Enrico on a surfboard! Thank you Diana!!! We are in Australia now, so surfing pictures are comming up soon!!! Realmente essa viagem está fantástica! Eu tenho uma dúvida! Se quisermos ter o bebê através da Cesariana é possível? Houvi dizer que na Alemanha as intervenções cirúrgicas são realizadas somente em casos de extrema necessidade. Minha médica brasileira aconselhou-me a fazer Cesariana por ter já 43 anos de idade. Moro na Alemanha e trabalho em um hospital aqui, mas não na ginecologia. Os partos aqui, mesmo os hospitalares, são frequentemente naturais. Da minha sala consigo ouvir os gritos da mãe, quando o bebê já está nascendo, e depois o choro gostoso do bebê que nasceu sendo respeitado. É muito bonito…. Próximo história Birth: climbing a big mountain!Parto: escalando uma grande montanha!